Part worn tyres are tyres that were previously fitted to another vehicle but are still in perfect condition. The legal tread wear limit is 1.6mm. All our part worn tyres have on average of between 5mm and 7.5mm tread remaining and are in perfect condition. Are your tyres E marked? Yes, all tyres we sell have an E mark which is a compulsory requirement to pass NCT test. An E-mark confirms that a tyre meets minimum EU or International (UNECE) standards in relation to its dimensions, load and speed rating. E-mark tyres have been tested to ensure adequate tread depth and performance ability. Are your tyres safety tested? Every part worn tyre we sell is individually tested and assessed to meet only the highest safety standards. All tyres are fully tested and assessed individually. When contacting us please have the size of your currently fitted tyres ready. 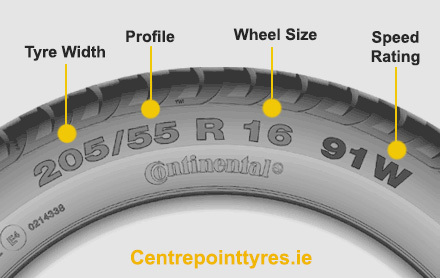 Please refer to the image below explaining on how to find your tyre size. These guys are providing outstanding service! Thank you! This is probably the best place in Dublin if you are looking for high quality used tyres. Thanks for such a great service and such a low prices! Keep up the good work. Very competitive prices - would definitely come back again!